I’ve got a lovely bunch of – Coconuts! It’s coconut day! I am often tempted by a fresh coconut, especially if when I shake it, it has plenty of water inside. But then it sits in the fruit bowl, waiting… well today is the day! 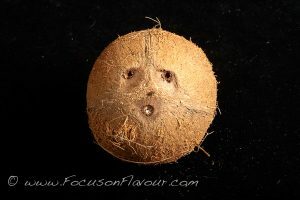 Here is our coconut friend. I start by making holes in and draining out the coconut water. This makes a fabulous electrolyte-balancing drink on a 5:2 fast day. In the UK you can buy coconut water ready prepared, probably made from green coconuts, which have a lot more liquid. But I can’t buy that here in France, so getting it from a coconut is the only way…. They have to be fresh though; if they have been sitting on the supermarket shelf for weeks, the liquid dries out and the flesh can go bad. So always give a coconut a good shake before buying it. I put the coconut in a zipped plastic bag and smash it onto the concrete outside, until it is broken into several pieces. I was really lucky with this one, the shell broke off cleanly, leaving the flesh with it’s skin in a few big chunks. Rinse in cold water. Then I take a few pieces (about 60g) and make slivers using a swivel potato peeler. These go on a baking sheet, to be toasted in the oven. 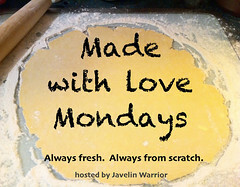 The remaining flesh is peeled – I find slicing it off with a small sharp knife the easiest way to do it. Then cut into chunks. A few chunks get set aside, just for the joy of eating some fresh coconut. Put the rest into a blender along with about 250ml water and blend until the coconut is finely chopped and looking creamy, adding some more water if it seems a little dry. Turn out the flesh and liquid into a sieve lined with a piece of muslin, over a bowl. Add a little more water to the blender and whizz up to get the last bits of coconut, then add that to the sieve. Gather up the cloth and squeeze to get out as much liquid as possible. 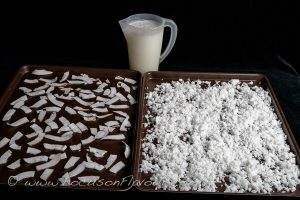 Turn out the remaining coconut flesh and spread over a baking sheet. 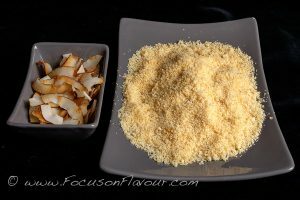 Heat the oven to 160c (fan) and toast the coconut flakes and flesh, turning occasionally until dry and lightly golden. The flakes will only take a few minutes, keep an eye on them. The flesh will take longer; just turn and spread out again a few times, until pale golden and almost dry. Now you have coconut milk, coconut flakes and dry (dessicated) coconut, as well as a small glassful of coconut water. The dry coconut doesn’t have so much flavour, as so much of the fat has gone into the milk; but it is a great source of fibre and is a good addition to curry or dhal, or a great topping for a dessert. I store it in a plastic box with a lid. You could grind it up to make coconut flour too. I haven’t tried that yet. I’m going to use the milk in a coconut and lime ice, which will be served topped with toasted coconut flakes. Yummy! The milk is not as creamy as the cans or packs you can buy, as they usually are thickened with guar gum; but the flavour is lovely. Instead of a sugar syrup I will use a few teaspoonfuls of Agave syrup, which will just take the edge off the sharpness without adding a lot of calories. How many calories in all these various coconut things is a bit of a puzzle. A typical coconut is 1405 calories. I weighed the flakes before and after and they work out to less than 8 calories per gram. Dessicated coconut is less than 7 cals per gram and I have ended up with about 100 grams of that. So by a process of elimination, I reckon the coconut milk is about 600calories. But hey, it’s not a fast day, so we don’t need to worry too much. Coconut is full of good things and is said to be a boost for our immune systems, helping to protect against viral and bacterial infections. With the number of people around that seem to have suffered from something or other these last few weeks, I think we will be glad of some extra support in that.